This gamer's significant other has made him a real life Claptrap from Borderlands for his birthday, and yes, it looks awesome. While chances of us getting abilities in real life from Gearbox Software's action-RPG Borderlands won't be happening anytime soon, Reddit user Phil Vader's girlfriend has possibly made the next best thing -- and that's creating him a real life Claptrap. 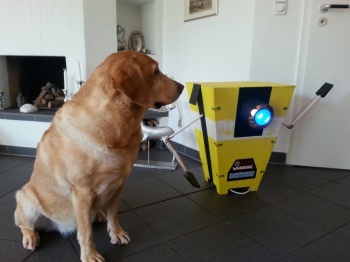 As proof of its creation, a picture of the robot was posted online next to his dog and it even has a functioning eye. I doubt it can talk, but needless to say, if you're a Borderlands fan, this might be one of the best presents you can ever get. You can check out another image that shows how it looks next to a banana for scale. The "CL4P-TP General Purpose Robots," or more commonly known as Claptraps, are manufactured by fictional company Hyperion and were found scattered about in Pandora and when fixed, would give the player a reward. In Borderlands 2, the original Fyrestone Claptrap makes an appearance and helps the Vault Hunters in their quest, as well as provide snappy banter to engage players. In other Borderlands news, the latest game in the franchise has been announced and will be called Borderlands: The Pre-Sequel. and is being developed 2K Australia and not series creator Gearbox. Oddly enough it's only set to come out for last-gen consoles and PC this fall and not for the PlayStation 4 and Xbox One.